After jumping 50% between 2016 and 2017, data center REITs delivered an uncharacteristically weak 2018, dipping 14% last year despite a continued boom in data center demand. Data center leasing smashed records in 2018, jumping more than 30% for data center REITs, powered by a nearly 50% surge in capex spending from hyperscale providers. A concern for investors, the competitive landscape is quickly shifting as these "big tech" hyperscale providers are increasingly dictating the terms of the still-symbiotic relationship between REITs and their tenants. 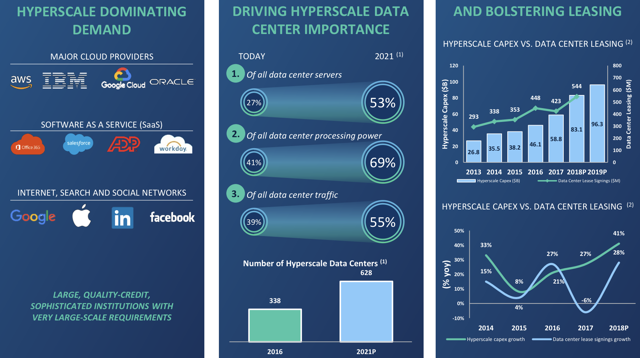 Digital Realty expects half of all data center servers to be operated by just a half-dozen hyperscale providers by 2021, up from 25% today, increasingly resembling cell tower industry dynamics. 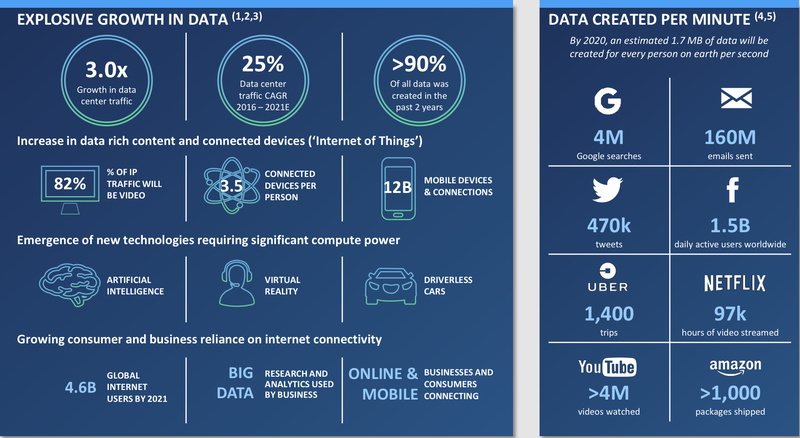 For now, the substantial secular tailwinds driving data demand and network densification including 5G, artificial intelligence, and blockchain technologies are enough to keep hopes high for continued growth. In our REIT Rankings series, we introduce and update readers to each of the commercial and residential real estate sectors. We rank REITs within the sectors based on both common and unique valuation metrics, presenting investors with numerous options that fit their own investing style and risk/return objectives. We update these rankings every quarter with new developments for existing readers. Data Center REITs comprise roughly 8-10% of the REIT Indexes (VNQ and IYR). Within the Hoya Capital Data Center Index, we track the five largest data center REITs, which account for roughly $75 billion in market value: Equinix (EQIX), Digital Realty (NYSE:DLR), CyrusOne (CONE), CoreSite (COR), and QTS Realty (QTS). Other companies operating in the space include European-based Interxion (INXN) and US-based Iron Mountain (IRM) and Switch (SWCH). Data centers are the physical home to the cloud: the outsourcing of computing processing and storage capacity from one's own device to an off-site data center. As connectivity speed and bandwidth capacity continue to improve, the economics of utilizing cloud computing relative to on-site processing capacity is increasingly favorable for most applications, which has prompted an insatiable wave of demand for data center space. Double-digit annual growth rates are expected over the next decade in IP traffic, storage needs, and mobile computing demand, powered by emerging technologies including 5G, blockchain, artificial intelligence, and the internet of things. The value of each data center is largely a function of its position along the internet backbone, the physical fiber optic network that links every connected-device across the world. Properties within the backbone are able to provide higher-value network-based "co-location" and interconnectivity services, which command higher rent-per-MW and generally have significantly higher barriers to entry. Properties on the periphery typically provide more ubiquitous enterprise-based services, including storage and cloud-based software applications and primarily rent these facilities to wholesale customers who pay lower per-SF rent. REITs are among the largest owners of investment-grade data centers in the United States and around the world, owning roughly 30% of data centers in the US, according to our estimates. It's important to note that the competitive landscape, particularly in the lower-barrier wholesale data center market, is quickly shifting as "big tech" hyperscale providers - Amazon (AMZN), Microsoft (MSFT), Google (GOOG), Alibaba (BABA), and IBM (IBM) - are increasingly dictating the terms of the still-symbiotic relationship between REITs and these large tenants. Digital Realty expects half of all data center servers to be operated by just a half-dozen hyperscale tenants by 2021, up from 25% today. 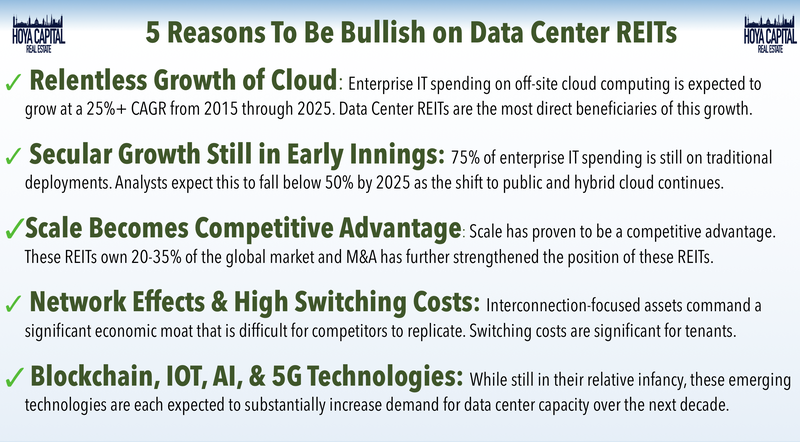 We think that this rapidly shifting competitive environment warrants a reevaluation of the longer term outlook for the data center REIT sector, especially the REITs that focus exclusively on wholesale data center services. Flush with cash, "big-tech" has invested enormously over the last five years in enterprise cloud services and building out network capacity, primarily by leasing massive quantities of space from these data center REITs. 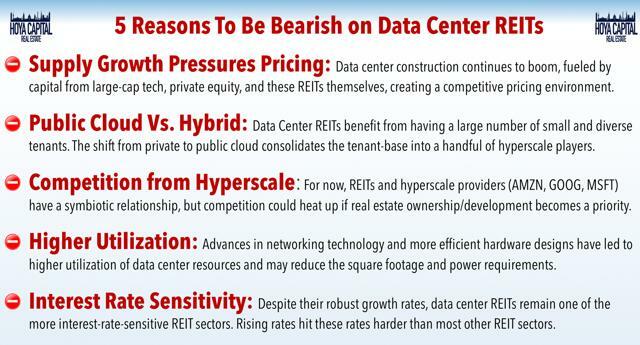 While certainly, a short-term win for these REITs, these "public cloud" offerings are increasingly winning business from larger corporate customers that may have historically deployed a more traditional hybrid cloud solution that involved these clients renting space directly from these data center REITs. While Digital Realty only projects out to 2021, we see hyperscale players commanding a growing share of total data center traffic and processing power and that more firms will work exclusively in the "public cloud." We see the industry evolving into a model more akin with the cell tower REIT sector whereby a small number of "carriers" have an effective duopoly or triopoly due to the cost advantages of scale and network effects. For now, the substantial secular tailwinds driving data demand and network densification including 5G, artificial intelligence, and blockchain technologies are overpowering the negative effects of reduced pricing power and the relationship between these REITs and their "big-tech" tenants is still symbiotic. We see the wholesale market becoming increasingly competitive with a smaller number of larger players but see sustainable competitive advantages in the higher-barrier connectivity-based services. Equinix has the highest "quality" portfolio of network-dense assets followed by Digital Realty and CoreSite (each roughly 30%). CyrusOne, QTS, and the majority of non-REIT data center operators focus primarily on more competitive wholesale assets. 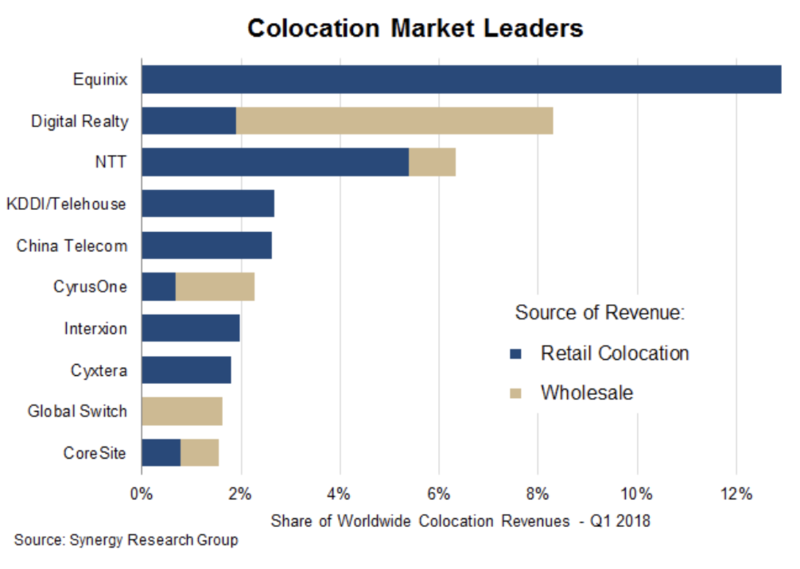 We believe that these wholesale-focused REITs may benefit from continued consolidation as an effective way to curtail the pricing power of hyperscalers as we saw with Digital Realty's acquisition of wholesale-focused DuPont Fabros in 2017.
Business spending on cloud infrastructure is still in its infancy, as nearly 75% of global IT spending is still on traditional IT. According to IDC, cloud deployment is expected to steadily accelerate over the next decade, and by 2020, more than 50% of IT spending will be on cloud-based infrastructure. The economics of cloud deployments are expected to remain highly favorable for the foreseeable future. 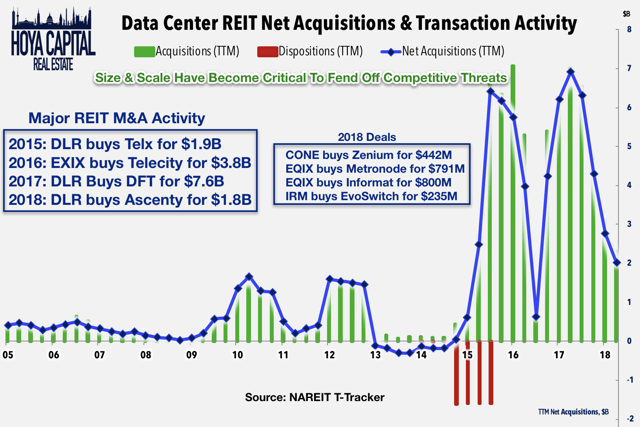 Data Center REITs may be able to retain pricing power through consolidation and we believe that scale is a competitive advantage that may lead to accretive acquisition-fueled growth. 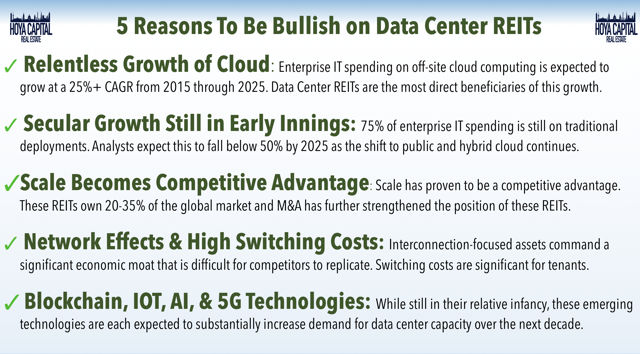 Below, we outline five reasons that investors are bullish on the data center space. A concern for investors has been the emerging power of large-cap technology firms within the data center space. "Hyperscale" providers including Amazon, Google, and Microsoft rent massive amounts of space from data center REITs but command significant pricing power relative to smaller, individual private or hybrid cloud leases. While REITs and large-cap technology firms currently have a symbiotic relationship, this may not always be the case and in recent quarters, a higher percentage of leasing has come from a smaller number of these power customers. 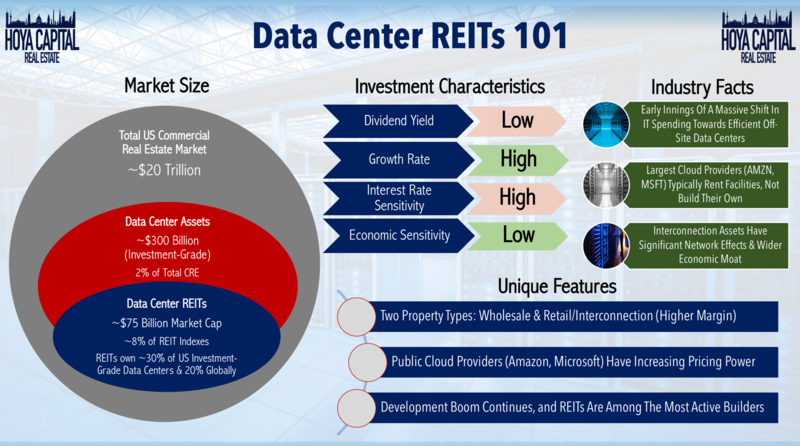 Additionally, due to long lease terms and the triple-net structure of most leases, data center REITs are more interest-rate-sensitive than other REIT sectors despite their exposure to the high growth technology sector. Below, we outline five reasons that investors are bearish on the sector. Data center leasing smashed records in 2018, jumping more than 30% for data center REITs, powered by a nearly 50% surge in capex spending from hyperscale providers. 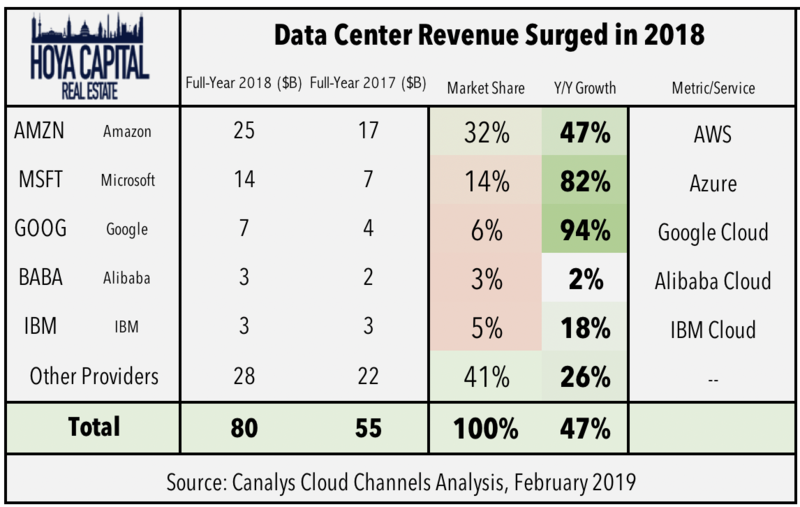 Data center revenue from the "Big 5" cloud giants was off-the-charts in the first half of 2018, but tailed off towards the end of the year, sparking concern that 2019 may see slowing or negative growth in total leasing activity as excess capacity is absorbed. 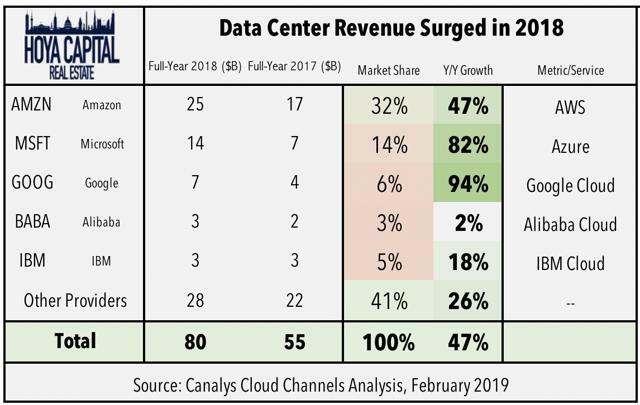 Data center and cloud-related revenue topped $80 billion over the last twelve months, a 47% jump from the same period in 2017 according to data from Canalys Cloud. Combined, the five REITs reported more than $510 million in net annualized leasing in 2018, up from $385B in 2017. Pricing continues to be a key focus and despite reporting a solid 0.3% rise in renewal rental rates for 2018, Digital Realty still sees a rather steep decline in renewal rates, forecasting "down high-single-digits" in 2019, partially attributable to a large above-market lease in the acquired DFT portfolio, but we think it is a sign that competitive pressures from hyperscale providers continue to pressure rental rates. CoreSite, however, continues to report a "stable" outlook for pricing. 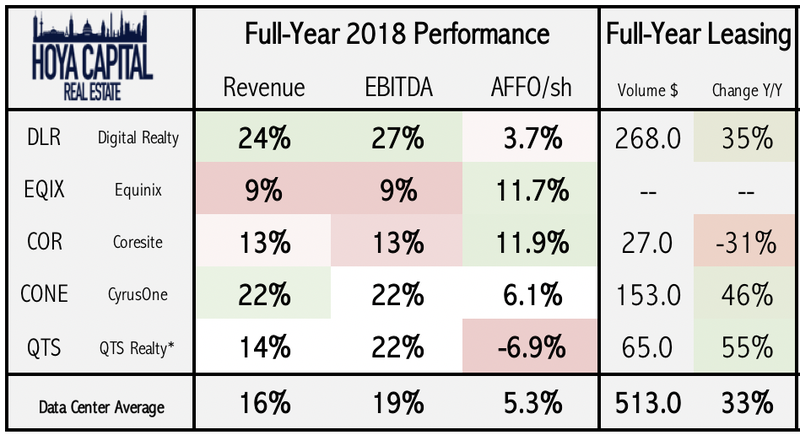 Despite record leasing activity, AFFO per share growth slowed considerably in 2018 due to a) weak pricing trends on new and renewed leases; b) near-term dilutive effects of recent M&A deals (DLR and DFT); c) dilutive corporate restructuring in response to competitive threats from hyperscale providers (QTS) and; d) moderating yields on new development, hurt by low equity valuations across the entire REIT sector. REIT executives see more of the same in 2019, forecasting an average 3% growth in AFFO per share, led by Equinix at 10%. 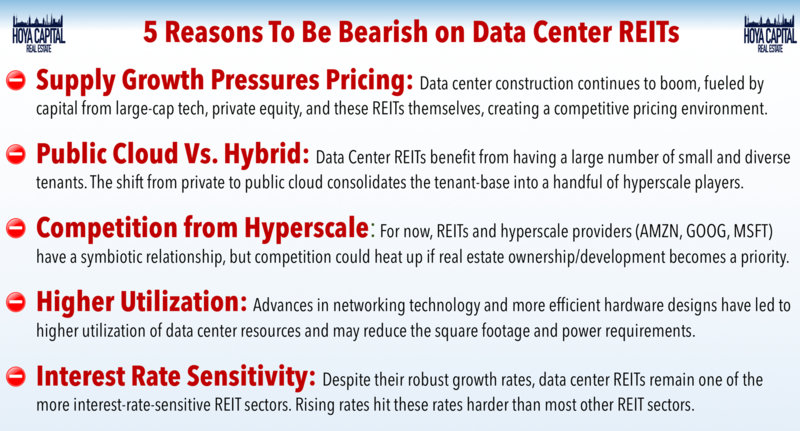 Weak pricing power, however, is nothing new for data center REITs, and until recently, double-digit development yields more than offset modest organic growth. Historically, cash rent growth on renewals has averaged less than 3% across the sector. In other words, the performance of these data center REITs has been fueled by external growth while the underlying organic growth metrics have been average at best, a potential area of concern if and when demand growth moderates. 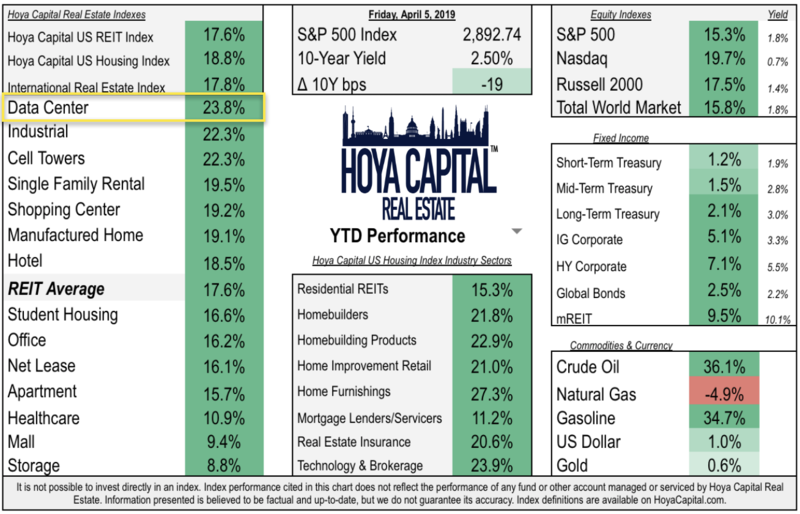 Development continues to be the primary means of value-creation for these REITs as internal growth fundamentals remain at roughly inflation-matching levels. The development pipeline remains as large as ever, briefly exceeding $3 billion at the end of 3Q18 and finishing 2018 at $2.9B. Despite trading at the weakest average FFO and NAV valuations since 2013, the furious pace of M&A activity that began in 2016 continued into 2018 with Digital Realty's announcement of a $1.8 billion acquisition of Brazilian data center giant Ascenty. Size and scale have proven to be competitive advantages in the data center space, and these REITs have used acquisitions as a means to stay in front of competitive threats from hyperscale providers. 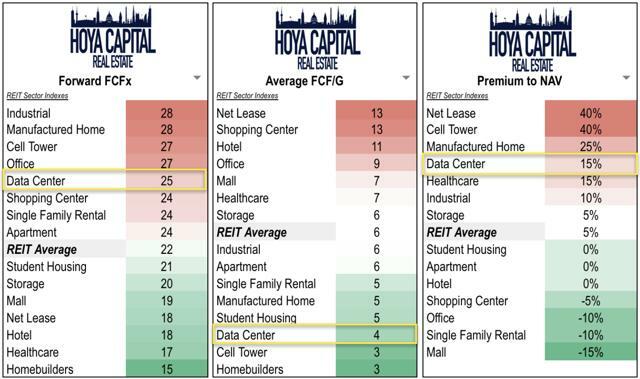 Amid the 'REIT rejuvenation' of 2019, data center REITs are now trading at a 10-20% premium to NAV. Given the importance of cost of equity capital to external-growth-dependant REITs, we think AFFO growth is likely to surprise to the upside this year if interest rates behave. 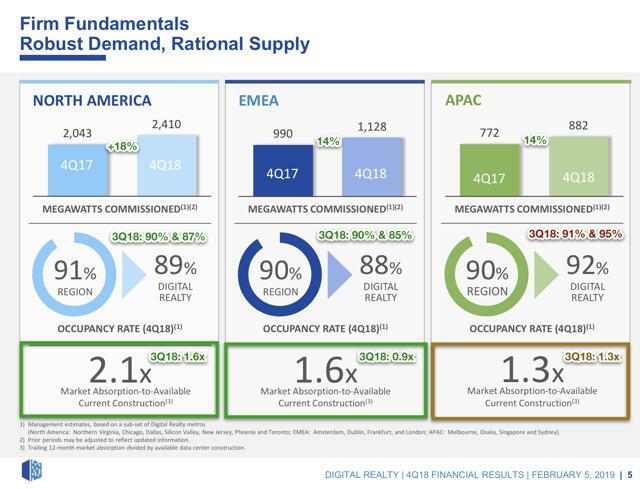 Supply/demand fundamentals were roughly balanced in 2018 and improved throughout the year despite record levels of new construction. 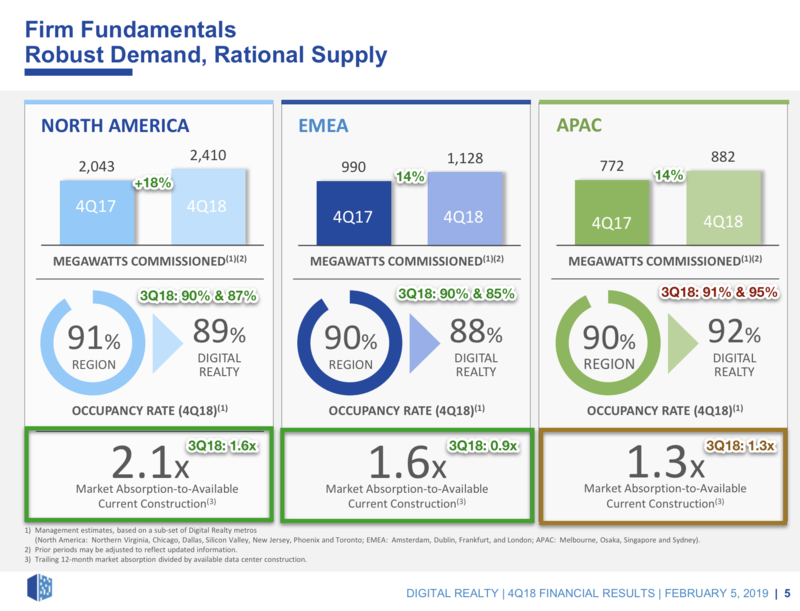 Digital Realty continues to believe that barriers to entry will gradually develop in major data center markets in the US, but we think we may still be several years away from seeing true constraints on supply growth. These barriers include lack of available land, limited, or unaffordable power supply, as well as barriers associated with having sufficient scale to fulfill the ever-increasing demands of hyperscale tenants. Digital Realty reported a TTM absorption to current pipeline multiple of 2.1x in the United States, an improvement from last quarter's reading of 1.6x and stronger than the EMEA and APAC regions. 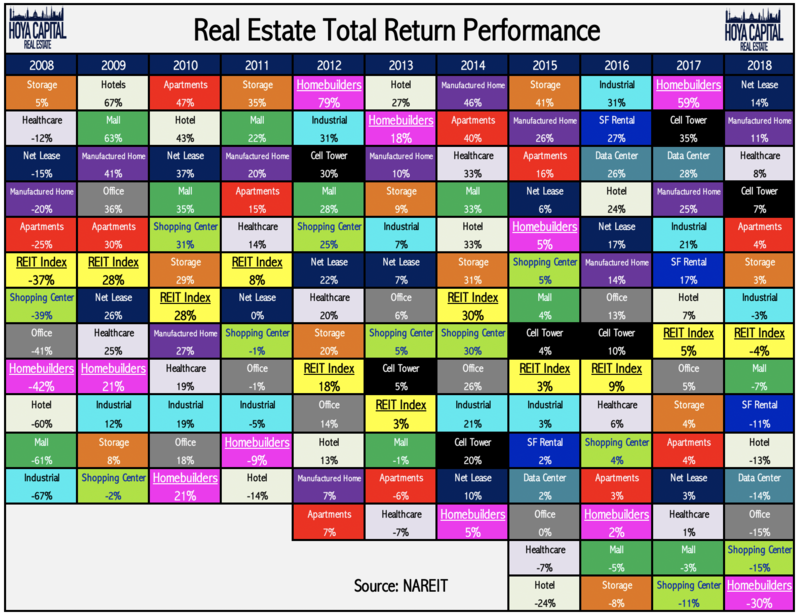 Riding the secular boom in technology over the last decade, Data Center REITs had been a perennially top-performing REIT sector in the post-recession period, returning more than 25% in both 2016 and 2017 before dipping 14% last year, the weakest year for the sector since 2013. Data center REITs have roared back to life in 2019 with the Hoya Capital Data Center REIT Index surging 24% through the first three months of the year compared to an 18% gain in the broader REIT index. 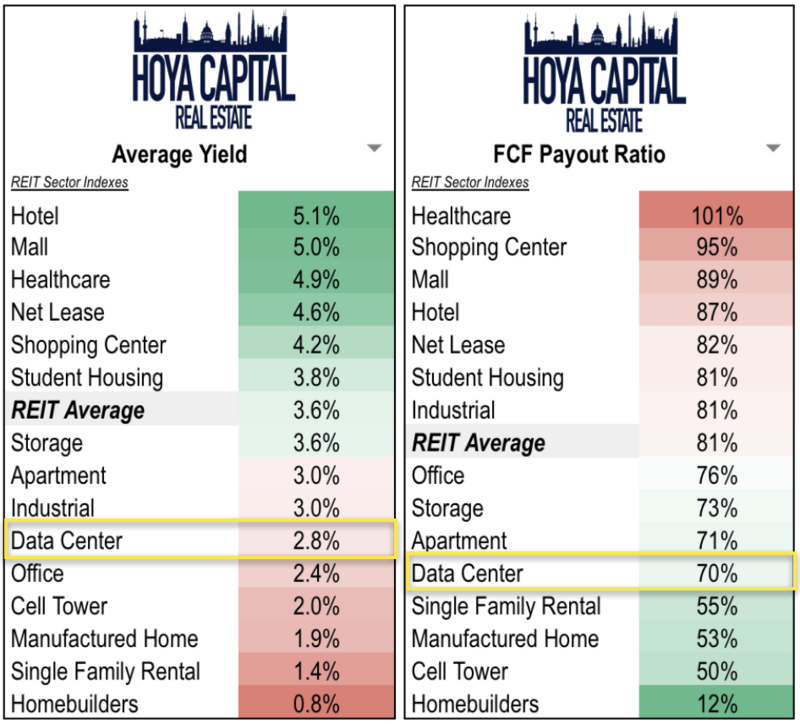 Among the more interest-rate-sensitive REIT sectors, data centers have benefited from the sharp retreat in interest rates since the 10-year yield peaked last October around 3.25%. Equinix has been the strongest performer this year, climbing by more than 30% after dipping by 20% in 2018, followed by CoreSite, which has jumped 26%. The smaller wholesale-focused REITs - CyrusOne and QTS - have lagged over the last two years. At the time of publication of our prior update, Data Centers REITs: Tech Trouble, the sector traded at the lowest valuations of the post-recession period on both an absolute level and relative to the broader REIT sector. Since then, valuations have improved from a low around 20x Free Cash Flow (aka AFFO, FAD, CAD) to 25x, a modest premium over the REIT average. Data centers still appear attractive based on our FCF/Growth metric. As noted above, Data center REITs trade at an estimated 10-20% premium to NAV, up from a slight discount at the end of 2018. Maintaining this NAV premium is critical to accreteively funding these REITs' external growth ambitions and maintain a critical cost of capital advantage over private market competitors. 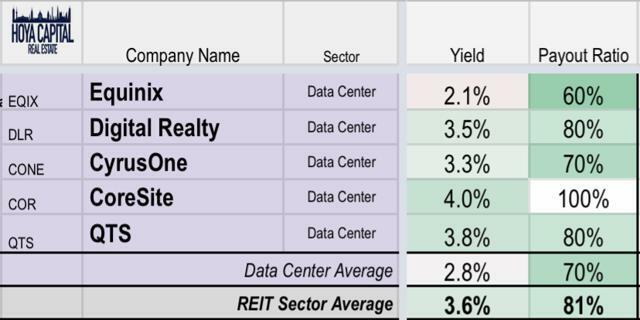 Data Center REITs rank below the REIT average when it comes to dividend yield, paying an average yield of 2.8% compared to the REIT average around 3.6%. 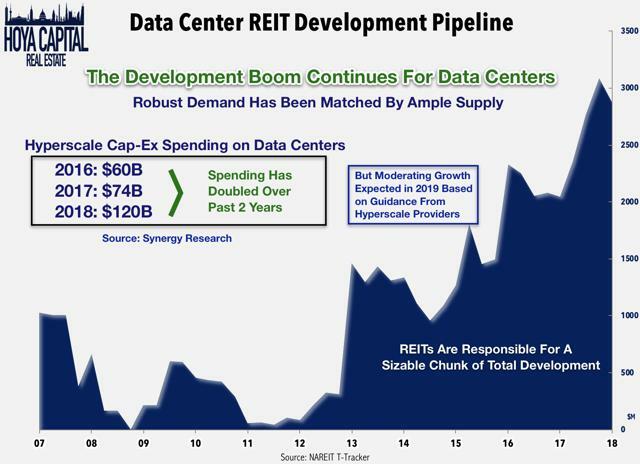 That said, data center REITs pay out just 70% of their free cash flow, leaving them ample capacity to increase dividends or reinvest in growth. 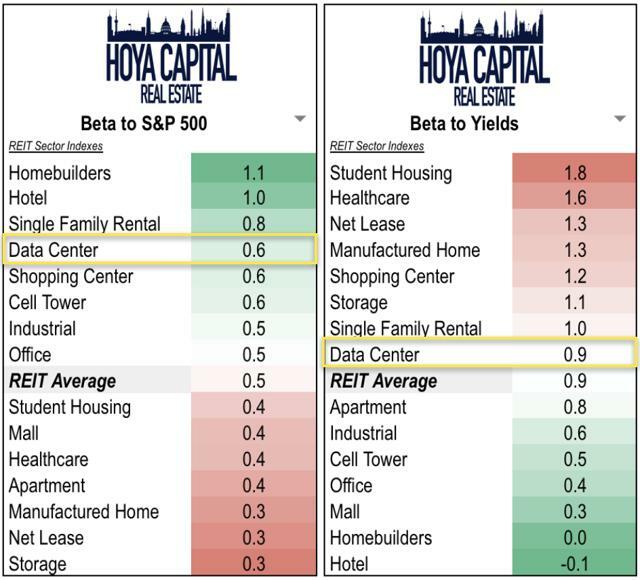 Within the sector, we note the differences in yield for these five REITs and an estimation of their approximate payout ratios. CoreSite yields a sector-high of 4.0% followed by QTS at 3.8% and Digital Realty at 3.5%. Equinix remains the most growth-oriented REIT, paying out just 2.1% but retaining more than 40% of free cash flow. 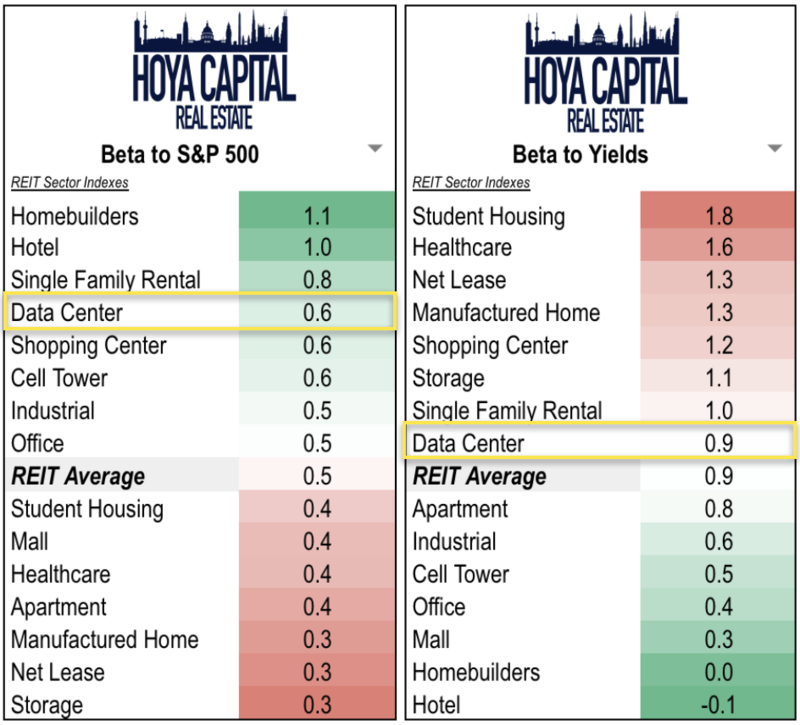 Data center REITs exhibit interest rate sensitivity that is above the broader REIT average, which is a surprise to many investors considering the sector's strong expected growth rates and high correlation to technology stock performance. High interest rate sensitivity is a result of longer-than-average lease terms and triple net lease structure on typical wholesale data centers. We separate REITs into three categories: Yield REITs, Growth REITs, and Hybrid REITs. Within the sector, we note that there are significant divergences in factor sensitivities. Digital Realty, CyrusOne, and QTS are among the more interest-rate sensitive REITs. Equinix, on the other hand, is among the least interest-rate sensitive and has one of the lowest correlations to the overall REIT index. After jumping 50% between 2016 and 2017, data center REITs delivered an uncharacteristically weak 2018, dipping 14% last year despite a continued boom in data center demand. 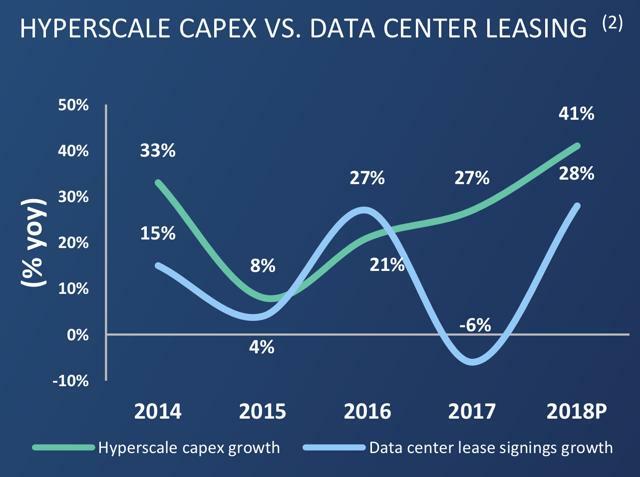 Data center leasing smashed records in 2018, jumping more than 30% for data center REITs, powered by a nearly 50% surge in capex spending from hyperscale providers. A concern for investors, the competitive landscape is quickly shifting as these "big tech" hyperscale providers are increasingly dictating the terms of the still-symbiotic relationship between REITs and their tenants. Digital Realty expects half of all data center servers to be operated by just a half-dozen hyperscale providers by 2021, up from 25% today, resembling cell tower REIT industry dynamics. While we remain convinced that the broader data boom will continue well into the next decade, we are less convinced that the economics will flow to the data center REIT sector to the same degree that they did over the past decade, particularly in the wholesale segment. For now, however, the substantial secular tailwinds driving data demand and network densification including 5G, artificial intelligence, and blockchain technologies are enough to keep hopes high for continued growth. If you enjoyed this report, be sure to follow our page to stay up-to-date on the latest developments in the housing and commercial real estate sectors. For an in-depth analysis of all real estate sectors, be sure to check out all of our quarterly reports: Industrial, Net Lease, Manufactured Housing, Student Housing, Single-Family Rentals, Apartments, Cell Towers, Manufactured Housing, Malls, Shopping Centers, Hotels, Office, Healthcare, Storage, and Homebuilders. Disclosure: I am/we are long DLR, EQIX, COR. I wrote this article myself, and it expresses my own opinions. I am not receiving compensation for it. I have no business relationship with any company whose stock is mentioned in this article.